Scuba Diving in New South Wales supports the livelihood of many locals. With several marine parks and reserves our precious underwater flora and fauna are protected from the pollution that besets so many of the world’s waterways. When you go Scuba diving in New South Wales you’ll find the conditions are usually moderate, depending on the weather, and visibility under water is generally very good. A fascinating collection of marine species including turtles, lion fish, endangered sharks, moray eels, sea urchins, and rare black coral gardens will be found on the many natural and manmade reefs in this area. It is also in New South Wales where you will find one of the best scuba diving sites in the entire world, The Pinnacles. If you have never seen a Grey Nurse shark before, then The Pinnacles is definitely a scuba diving site you shouldn’t miss. This is the only place I know where you can get to swim with over 30 Grey Nurse sharks all at once as well as manta rays, bull rays, kingfish, jewfish, White Pointer sharks, Bronze whalers, and Humpback whales. Sydney alone has over 30 scuba diving destinations with interesting names like The Gap, Gap Caves, Dee Why, Wedding Cake Island, The Apartments, The Overhang, and Royal Shepherd. All wonderful diving destinations that guarantee excellent undersea adventures for everyone. So many flights to Australia on sale make New South Wales easy to get to as well. Another popular site for Scuba Diving in New South Wales is Fish Rock Cave, only 2 kilometres away from Smoky Cape along the Northern coast of New South Wales. In this site, tourists can dive with schools of clownfish, shells, and humpback whales. 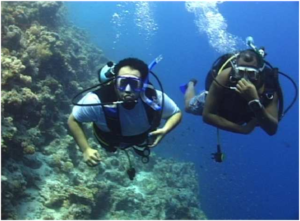 Experienced and certified professional scuba divers serve as guides and instructors in this wonderful getaway. Lord Howe Island, which is only a 2-hour flight away from Sydney, is one of the few places on earth where its beaches are undamaged and unspoiled. More than half of the island is covered by natural forests and is pollution-free. Its sandy coastlines offer refuge to marine species found only in Australia. This is a first-class diving destination but it also offers accommodation for budget wise travellers. Also, when you’re Scuba Diving in New South Wales, be sure to visit Jervis Bay, widely known for its quaint houses and villages, just over 2 hours from Sydney it is one of the most popular dive destinations. A wide assortment of southern marine species thrives along its coral reefs and coastlines, making it the southern counterpart of The Great Barrier Reef and diving in Jervis Bay is possible any time of the year because of its interestingly unique land formation. Another diving site worth visiting is Julian Rocks Marine Park, just 2.5 kilometres off the coast of Byron Bay in northern New South Wales. Its unique water temperatures support exotic marine life such as leopard sharks, cuttlefish, strange looking water animals, and dolphins and endangered species such as Nurse Grey sharks as well as schools of deep sea fish thrive in this aquatic haven. With its rich marine life, accommodation to suit every budget and very friendly locals it’s an Australian diving destination that you shouldn’t miss.